The Bible speaks of Jesus as the Bridegroom, and His followers as His Bride. The Day of His return for her will be a glorious day of rejoicing – but what exactly does all of this mean? Jesus, the Jewish man, living a Jewish lifestyle and observing Jewish customs, gave us a clear indication of what it means. What can we learn from the traditional Jewish wedding customs about “that glorious Day”? What does the relationship between a Jewish Bride and her groom tell us of our relationship with our Saviour, Jesus? And what does it mean for the Bride to have “prepared herself”? In Ready or Not – He is Coming Stephanie Cottam explores the biblical marriage rites in the light of Christian revelation and brings Jesus' simile to life in a straightforward and disarmingly simple way, adding the rich insights that so often come from a Jewish believer in Jesus. 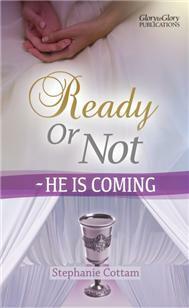 But with a stark warning: Jesus was crystal clear that, when He returns, not everyone will be ready for Him. Some will make their excuses and decline His invitation. Some of His Watchmen will be asleep, spiritually speaking. A high proportion of foolish maidens will have no oil in their lamps – both groups will be left outside. What sort of a follower of Jesus are you? Are you prepared and ready – or half asleep, seeking other diversions during His long absence? Stephanie Cottam's book encourages us to evaluate our own “wait” for the Groom, as well as gain fascinating insights into first century courtship and marriage. Whether we are ready or not, He truly is coming. Those who want to understand the Jewish roots of the Bible, in order to gain a deeper understanding of our faith. Those who want to understand the theology around the Lord's return in triumph. Christians who want to get a fresh insight into the Lord's relationship with his church. Stephanie Cottam works for the Church's Ministry among Jewish People (CMJ), and regularly writes a magazine for Christian young women. She loves to delve into the Jewish heritage of her family, and gain an understanding of the Jewish foundations of her Christian faith She is part of the new wave of writers exploring Christianity with a consciously Hebraic mindset, explaining the connections between our Lord, the Jewish Messiah, and His Hebraic hinterland. This is quite simply not a book to be missed! Challenging and delightfully engaging at the same time. There is now some free bible study material associated with this book that you can download.